In alignment with a key emphasis of other Brill Book’s (which bought out Rodopi Books) book series, Critical Animal Studies Book Series, a project of the Institute for Critical Animal Studies, challenges animal studies and research exploitation of nonhuman animals, by linking theory to practice and practice to theory and emphasizing the immense importance of animal advocacy for a humane, democratic, peaceful, and sustainable world. Critical Animal Studies Book Series, founded in 2009 by Anthony J. Nocella II is interdisciplinary and intersectional with an emphasis on total liberation and freedom for all. This Series was designed to build up the common activist’s knowledge of animal liberation while at the same time appealing to academic specialists to address the important topic of animal liberation, rights, freedom, and advocacy. Taking an interdisciplinary approach to questions of social change, moral progress, and ecological sustainability, the Critical Animal Studies Book Series will connect with a broad range of disciplines such as Women’s studies, globalization, economics, queer and trans studies, science, disability studies, history, environmental studies, ethnic studies, media studies, political science, sociology, religion, anthropology, philosophy, and cultural studies. 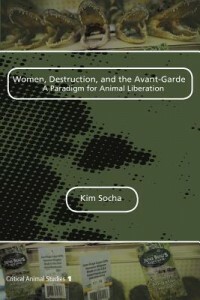 This interdisciplinary study fuses analysis of feminist literature and manifestos, radical political theory, critical vanguard studies, women’s performance art, and popular culture to argue for the animal liberation movement as successor to the liberationist visions of the early twentieth-century avant-gardes, most especially the Surrealists. These vanguard groups are judiciously critiqued for their refusal to confront their own misogyny, a quandary that continues to plague animal activists, thereby disallowing for cohesion and full recognition of women’s value within a culturally marginalized cause. This volume is of interest to anyone who is concerned about the continued—indeed, escalating—violence against nonhumans. More broadly, it will interest those seeking new pathways to challenge the dominant power constructions through which oppression of humans, nonhumans, and the environment thrives. Women, Destruction, and the Avant-Garde ultimately poses the animal liberation movement as having serious political and cultural implications for radical social change, destruction of hierarchy and for a world without shackles and cages, much as the Surrealists envisioned. To what extent should animal rights activists promote animal rights when attempting to persuade meat-lovers to stop eating animals? 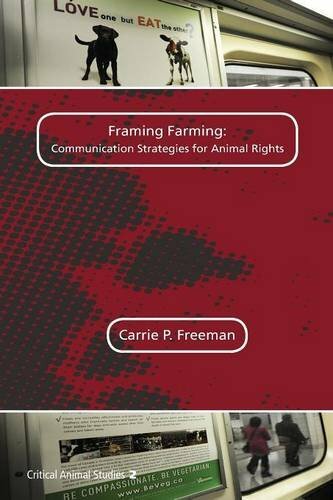 Contributing to a classic social movement framing debate, Freeman examines the animal rights movement’s struggles over whether to construct farming campaign messages based more on utility (emphasizing animal welfare, reform and reduction, and human self-interest) or ideology (emphasizing animal rights and abolition). Freeman prioritizes the latter, “ideological authenticity,” to promote a needed transformation in worldviews and human animal identity, not just behaviors. This would mean framing “go veg” messages not only around compassion, but also around principles of ecology, liberty, and justice, convincing people “it’s not fair to farm anyone”. We accept proposals, not full manuscripts. We will accept with your proposal one sample chapter. Cover sheet with title, name and contact information of author(s)/editor(s): address, phone-number, website, e-mail, and affiliations. Table of contents. In the case of a collection of essays by different authors around a central subject, add the contributors’ affiliations. Each chapter should have a 300 word about abstract interwoven in the Table of Contents. Whenever relevant, provide information about illustrated material or any other special graphic features that might be required. Your typescript. If already completed, specify the total number of words, including index, references and all other sections. If your project is in progress, give us an estimated date of completion and delivery, and approximate total length. If approved by both, the Rodopi Press will invite you to submit the full manuscript for consideration with a contract sent to you. The manuscript will be reviewed by members of the editorial board and/or by external reviewers. Once you have sent us the manuscript, the subsequent period of consideration by the editorial board is approximately three months. If your manuscript is accepted for publication, the Publisher will contact you about contract formalities as well as about any revisions needed. Every effort will be made to inform authors of the editor’s decision within 30 days of receipt of a manuscript. We request that you send the complete manuscript only upon invitation from the Publisher or a corresponding editor, completed and type-set. During this period we expect you to refrain from simultaneous or multiple submissions to other publishers. You can help us process your proposal if you adhere to the standard format of submission described above. Upon receipt, we will forward your full proposal to the Editorial Review Board of the Critical Animal Studies Book Series (see below) for consideration. It will take approximately a month for the board to decide whether to proceed with your proposal. We will then submit it to the Publisher (Rodopi Press) for an additional review process.